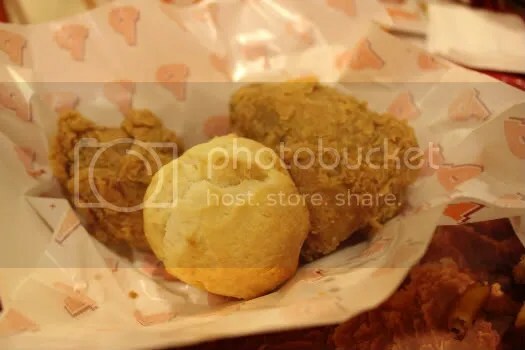 Popeye’s @ Cathay- Finger Lickin’ Good? The friend wanted to try the cajun fries while I was more interested about their buttermilk biscuit. Ironically, we weren’t that psyched about their fried chicken. The fried chicken franchaise hails from Louisiana and I must say it’s pretty praiseworthy. While it can never compare to Mrs Knott’s delicious fried chicken from Knotts Berry Farm in San Francisco, it is certainly a better alternative to KFC in my opinion. Fried to golden perfection, the meat of the chicken leg was moist and tender and the crunchy skin had a blend of spices that made it oh-so-tasty. The buttermilk biscuit was a savory one much to my disappointment. Again Knotts Berry Farm serves the most delicious buttermilk biscuits paired with a few choices of their very own homemade jam. 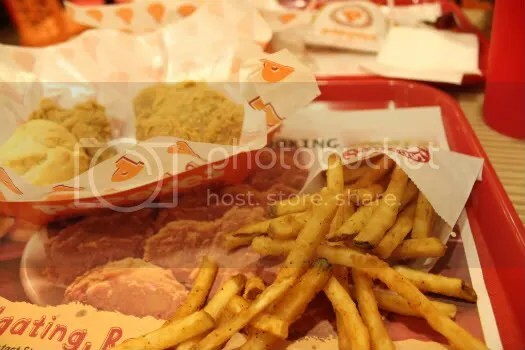 They are so addictive that it takes a lot of mental strength to restrain ourselves from eating too much before the actual fried chicken comes! But if there was anything that was done really right, it would be the cajun fries. I’ve tasted well cooked thick-cut chips ( in london of course) but not french fries. These were crisp on the outside and powdery on the inside despite being so thinly cut. And the secret lies also in the cajun seasoning that gives it a slight peppery touch. The friend prefers it with more salt, but I found it just right for me. And there is even better news, the fries don’t get soggy easily! They put Mac’s limp and soggy fries to shame.